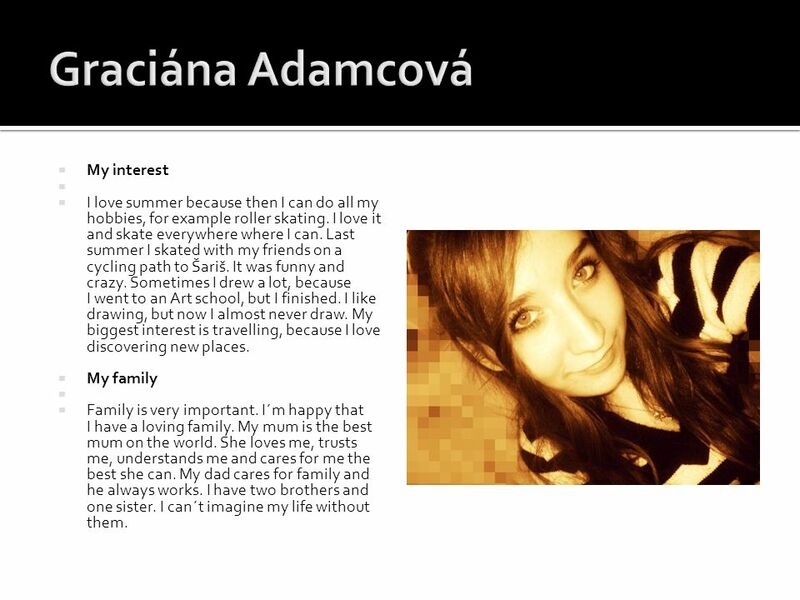 English project page Učíme sa pre život, 1. 10. 2009 Kód ITMS projektu: 26110130243. 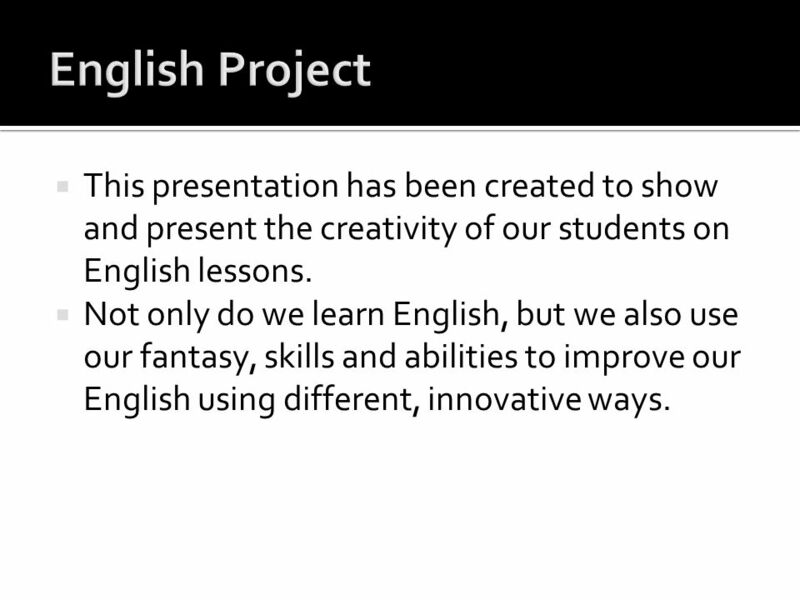 2  This presentation has been created to show and present the creativity of our students on English lessons.  Not only do we learn English, but we also use our fantasy, skills and abilities to improve our English using different, innovative ways. 3  My family  Although I have a big family, my closest family consists of only five members: my mother, my father, my grandmother, my grandfather and me.  I don´t have any brothers and sisters, I´m the only child. Sometimes it´s good, because I don´t have to share my room with anybody and my parents give me everything I want, because I´m their only daughter, but the most of time I feel lonely, so I wish I could have a sibling.  My mum´s name´s Marta. She´s 44 years old and now she´s unemployed. She´s very sensitive and she´s the biggest perfectionist I know, so she´s also strict, but I appreciate it, because I know that she just want the best for me.  My dad´s name´s Vladimír. He´s 40 years old and he works in a bank. 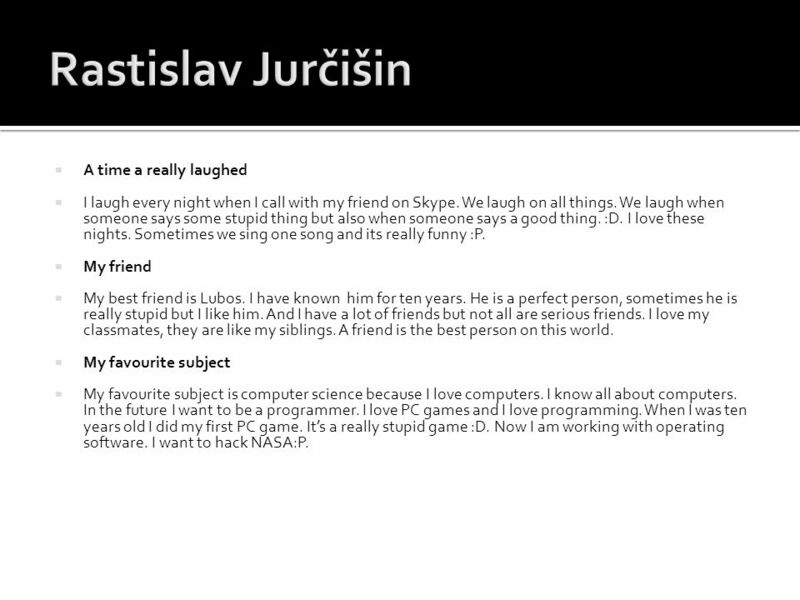 He´s very clever and sometimes strict. And everyone says that I really take after him.  The other two members of my family are my grandparents. They´re my dad´s parents. My grandma´s name´s Marta and she´s 61 years old. She likes cooking, for me she is the best cook in the world. My grandpa´s name´s Vladimír and he´s 60 years old. He likes working in a garden. Both my grandparents are pensioners. 4  My interests   I have a lot of hobbies in my free time, however it´s true that now I spend most of time doing my homework or preparing to school. But during the holiday I like doing many activities.  For example, I collect euro coins. My friends live all around Europe, so they always send me their national coins and I send them our coins. I have two albums where I collect them and I must praise myself that both of them are almost full.  Then I love reading. The most I like detective stories. I think I´ve read all Agatha Christie´s books. I love summer night storms while reading a good novel in my bed with a torch in my hand.  As I eat often and much, I must do some exercise. Especially in the summer I do some kinds of sport. I cycle a lot, climb trees, I like to go jogging in the morning, play badminton, tennis, table tennis, billiard... And there´s a tradition in our family – summer family games – when whole my family plays some games in teams, like darts, volleyball and many other disciplines. I really love it.  A time I really laughed   It´s very difficult for me to say, when the time I laughed the most was, because I laugh every day. I have really catching laughter, so when I laugh, everyone laughs with me. I often laugh on some old photos of myself or videos from my childhood.  And even my motto is about laughing: "When you cry, you cry alone, but when you laugh, whole world laughs with you. "  My friends   I really appreciate all of my friends and although we sometimes argue, I never regret meeting them and that we became friends.  I have many mates, but I have only two close friends. 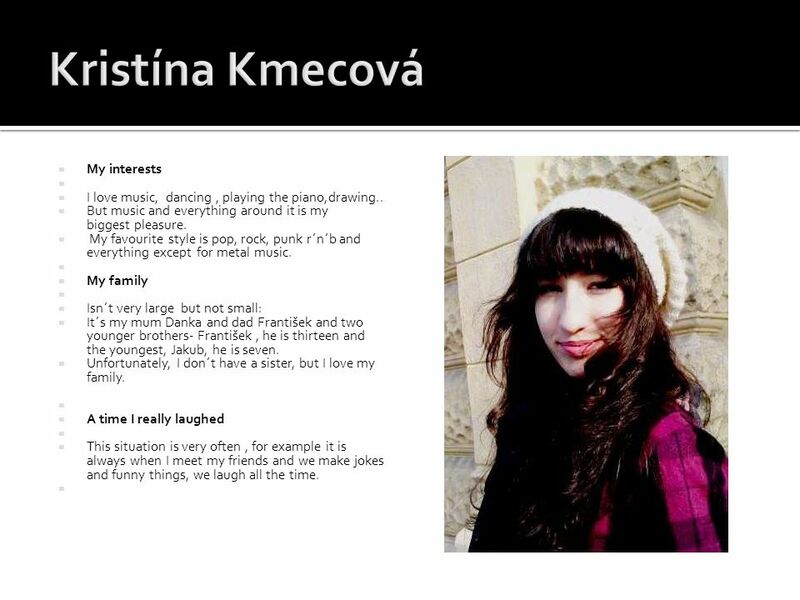 One of my close friends is my classmate – Kristína, but everyone calls her Kristy. We met on our first day at school and in a few minutes I realized that she´s very funny and really good friend for me. My other friend´s name´s Laurencia. I have known know her since our first class at primary school. We were always sitting together and we laughed a lot. 5  My first name and its history   My name – Barbara is derived from Greek βαρβαρος (barbaros) and it means "foreign". According to legend, Saint Barbara was a young woman killed by her father Dioscorus, who was then killed by a bolt of lightning. She is the patron of architects, geologists, stonemasons and artillerymen. Because of her renown, the name came into general use in the Christian world in the Middle Ages. Today it´s common name all around the world. 6  My interests  I love books. I often buy books because I don´t go to library. Sometimes I listen to music on my MP3 player, but I do not have a favourite group or singer. If I have free time I like to watch films in original version with subtitles. My favourite actress is Jessica Alba. And I like cartoons like Shrek or Ice Age or Cars too.  My family  My family isn´t very big. I have one brother. His name is David and he is younger than me. We live with our parents in a family house. I have three cousins. The oldest cousin Ivana goes to university and I don´t often see her. I have a good relationship with my second cousin Tatiana. She is only about two years older than me. 7  A time I really laughed  I do not remember when the last time I really laughed was. But I always laugh. Maybe 50 times per day :D. I laugh on comedies, jokes, sometimes on my friends, on myself...   My friends  I don’t have lots of friends. I prefer a few good friends than many ones whom I don´t know very well. I have three best friends Zuzka, Julka and Erika. It’s a pity that I haven´t seen Zuzka for one year because she moved to Vancouver and we can use Skype for calling.   My first name and its history  My name is Denisa. Name Denisa has origin in France and it´s from name of a Greek god Dionýz. 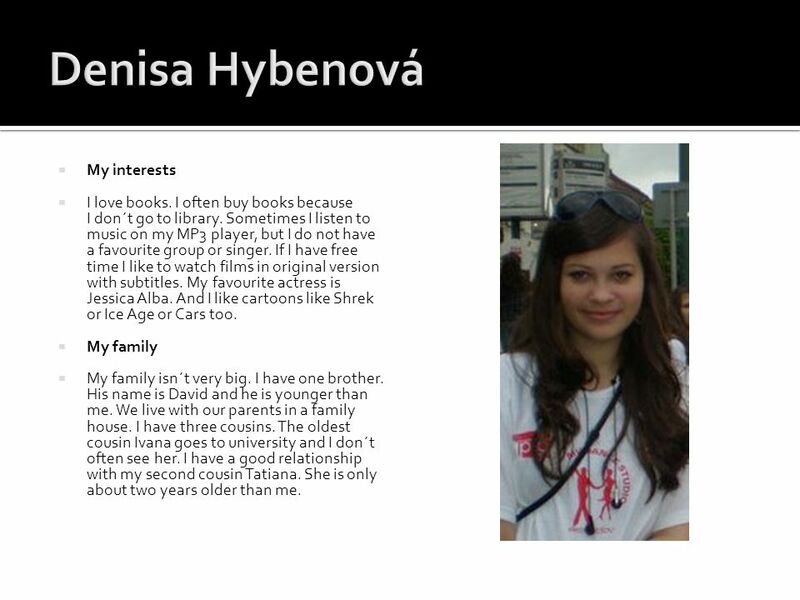 Denisa is in the calendar on 1. November. Lucky colours are orange, blue, white. Merkur affects people with this name. 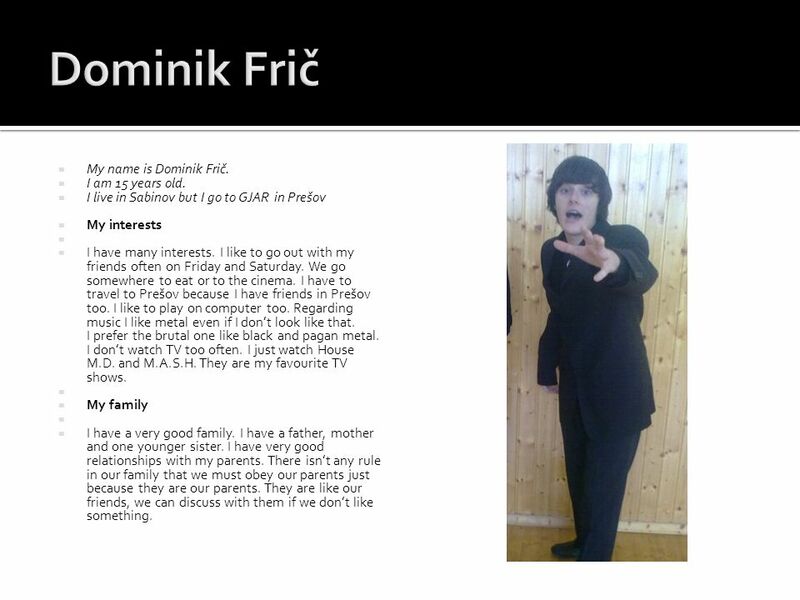 8  My name is Dominik Frič.  I am 15 years old. 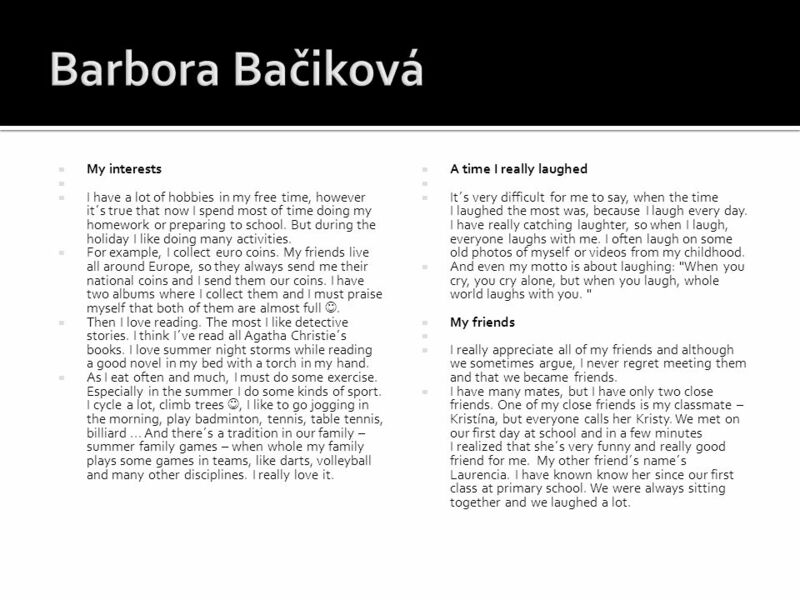  I live in Sabinov but I go to GJAR in Prešov  My interests   I have many interests. I like to go out with my friends often on Friday and Saturday. We go somewhere to eat or to the cinema. I have to travel to Prešov because I have friends in Prešov too. I like to play on computer too. Regarding music I like metal even if I don’t look like that. I prefer the brutal one like black and pagan metal. I don’t watch TV too often. I just watch House M.D. and M.A.S.H. They are my favourite TV shows.   My family   I have a very good family. I have a father, mother and one younger sister. I have very good relationships with my parents. There isn’t any rule in our family that we must obey our parents just because they are our parents. They are like our friends, we can discuss with them if we don’t like something. 9  A time I really laughed   I really laughed three years ago during the Biology lesson. We had a very careless teacher so my friend hid in the wardrobe (during the lesson). Teacher didn’t notice that. Then after a few minutes he started to whistle and the teacher wanted to know who that was. But she couldn’t see anybody singing! We said that it went from outside. My friend was in that wardrobe maybe for ten minutes and when the lesson ended I really laughed.   My friends   I don’t have many friends but the ones I have are very good. I think my best friends are my current and former classmates. With my former classmates we are still in contact and we organize many actions together. We have some special places in Prešov (like „Pysk“ and „Kopec“), where we always go.   My favourite subject   My favourite subjects are History, Religion and Physical education. I love History because I really like all that things with kings, empires and so on. For Religion education we have a very good teacher that teaches us a lot. 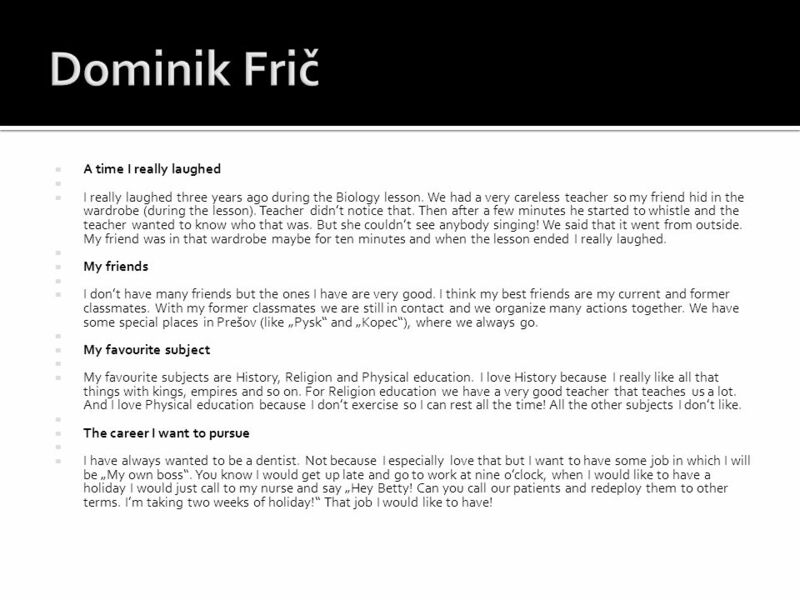 And I love Physical education because I don’t exercise so I can rest all the time! All the other subjects I don’t like.   The career I want to pursue   I have always wanted to be a dentist. Not because I especially love that but I want to have some job in which I will be „My own boss“. You know I would get up late and go to work at nine o’clock, when I would like to have a holiday I would just call to my nurse and say „Hey Betty! Can you call our patients and redeploy them to other terms. I’m taking two weeks of holiday!“ That job I would like to have! 10  My interests  Are for example reading books,listening to music, sleeping, going outside with my friends,shopping,watching movies.  I like reading good books because it´s the best way to relax. When I have free time I read lots of books. I prefer novels with exciting story. My most favourite book is „I want to be away for long time“ by Thomas Christopher Green and Pride and Prejudice and Zombies.My favourite singers are Beyoncé and Rihanna. I prefer these girls because they have a good voice. They have really good songs and very special looks.  My family  Consists of me and my parents. I have lots of cousins but just little ones so it isn´t good for me.  I like my family because we aren´t the same as other families. I´m the only child of my parents. Sometimes it is good, sometimes it is worse for me. When I was young they paid all attention to me and I was happy but now I´m not so happy when I make something wrong. I think the parents are the dearest who we have. 11  A time I really laughed  Is for me every day because I´m a funny person and people around me are comic too.  When I laugh I feel so free as if problems don’t exist. I like people who know how to exist with a good mood. In my opinion all people can be happy but some of them don´t know how. I actually laugh every day because life is so great and you don´t know when your last day is in your life so I always have smile on my lips.  My friends  Are people who laugh with me and cry when I cry. They accept all my personality with my mistakes.  I prefer people with an exciting character and a good heart. I have to trust to my best friend. Friendship is important for me. It is a connection for the whole life, but people must care about durable friendship. My friends are very good listeners and they know in a second what troubles me. It´s great when we have good friends. 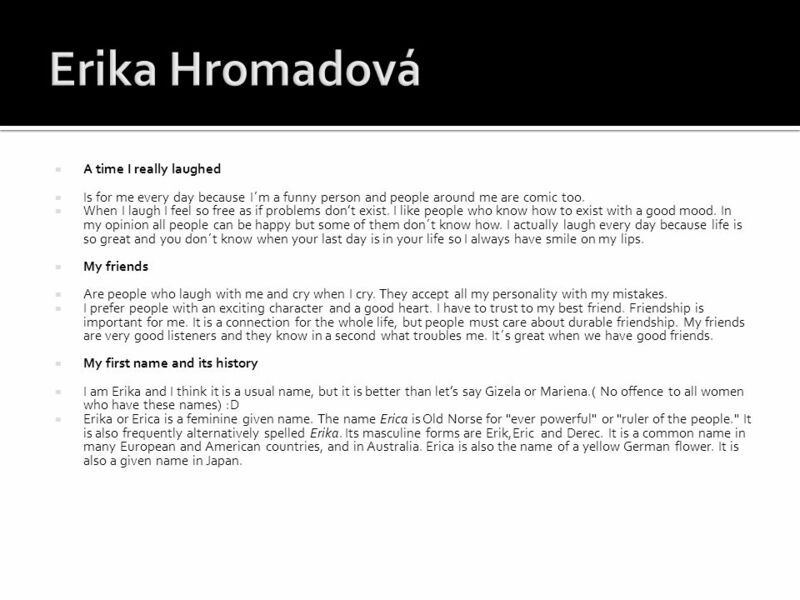  My first name and its history  I am Erika and I think it is a usual name, but it is better than let’s say Gizela or Mariena. ( No offence to all women who have these names) :D  Erika or Erica is a feminine given name. The name Erica is Old Norse for "ever powerful" or "ruler of the people." It is also frequently alternatively spelled Erika. Its masculine forms are Erik,Eric and Derec. It is a common name in many European and American countries, and in Australia. Erica is also the name of a yellow German flower. It is also a given name in Japan. 12  My interest   I love summer because then I can do all my hobbies, for example roller skating. I love it and skate everywhere where I can. Last summer I skated with my friends on a cycling path to Šariš. It was funny and crazy. Sometimes I drew a lot, because I went to an Art school, but I finished. I like drawing, but now I almost never draw. My biggest interest is travelling, because I love discovering new places.  My family   Family is very important. I´m happy that I have a loving family. My mum is the best mum on the world. She loves me, trusts me, understands me and cares for me the best she can. My dad cares for family and he always works. I have two brothers and one sister. I can´t imagine my life without them. 13  A time I really laughed   The smile is on my face almost every day. Well now I can’t remember just one situation when I really laughed. I laugh mainly when I am with my friends. We always do some crazy things. We laugh the most when we play a game, called „Kufor“. You have to do some silly activities for 2 or 4 minutes. For example, you have to show urine or microscope or some other things without sounds and your friends have to guess what it is. It is so funny.   My friends   I have a lot of friends, but only some are true friends. I have one friend, who knows everything about me. Her name is Daniela. I trust her because I know that I can. She is like my own sister. We were classmates at elementary school, but we have been really good friends for about 4 years. She and another 3 girls have been my darlings for about 4 years. Their names are Veronika, Wewa and Ivana. They helped me the most when I needed it. From the first day at the grammar school I have had another true friend. Her name is Klaudia. I didnt‘t know her before, but I know that I can trust her. We understand each other. She helps me and I like her so much. 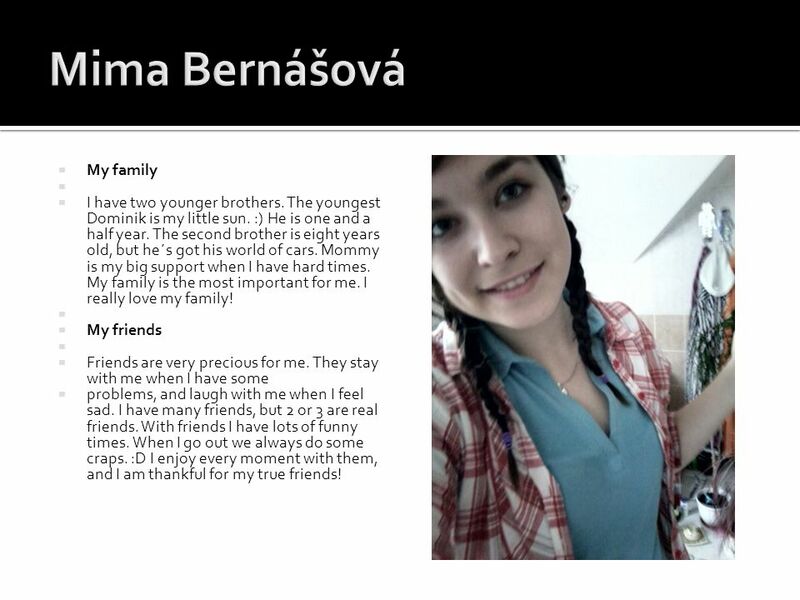 Two boys, Maroš and Peter, are my best friends too. They are good boys. Peter is my ex-classmate and I like when he needs advice from me. I hardly ever see Maroš, but when we meet we still have something to talk about. 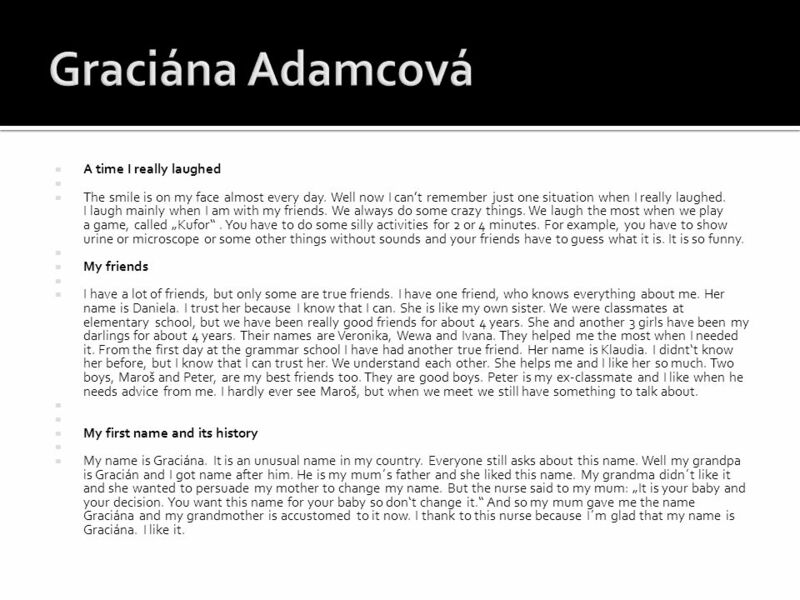   My first name and its history   My name is Graciána. It is an unusual name in my country. Everyone still asks about this name. Well my grandpa is Gracián and I got name after him. He is my mum´s father and she liked this name. My grandma didn´t like it and she wanted to persuade my mother to change my name. But the nurse said to my mum: „It is your baby and your decision. You want this name for your baby so don‘t change it.“ And so my mum gave me the name Graciána and my grandmother is accustomed to it now. 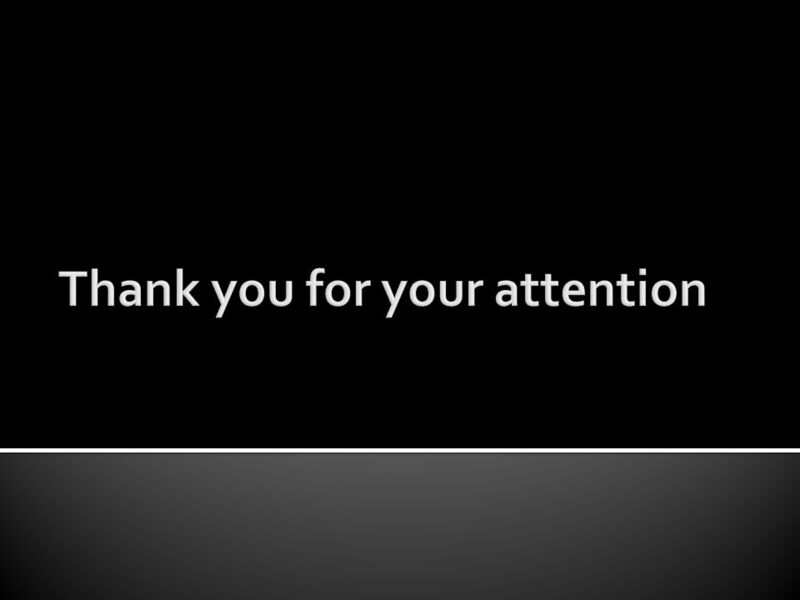 I thank to this nurse because I´m glad that my name is Graciána. I like it. 15  My friends   I have many friends, but only a few people are my best friends. They are the people who have my full trust.  I love to be out with them beacuse I know that I can rely on them in a lot  Of situations- funny, happy, sad, but also embarrassing...  We have the same interests and my friends are my second family.   My favourite subject   It´s not History or Physical education, but it´s subject, where we can relax a bit from learning. We are talking in the circle about things of life, about our interests and many others topics. The Religion education is really an unusual subject and I like it. 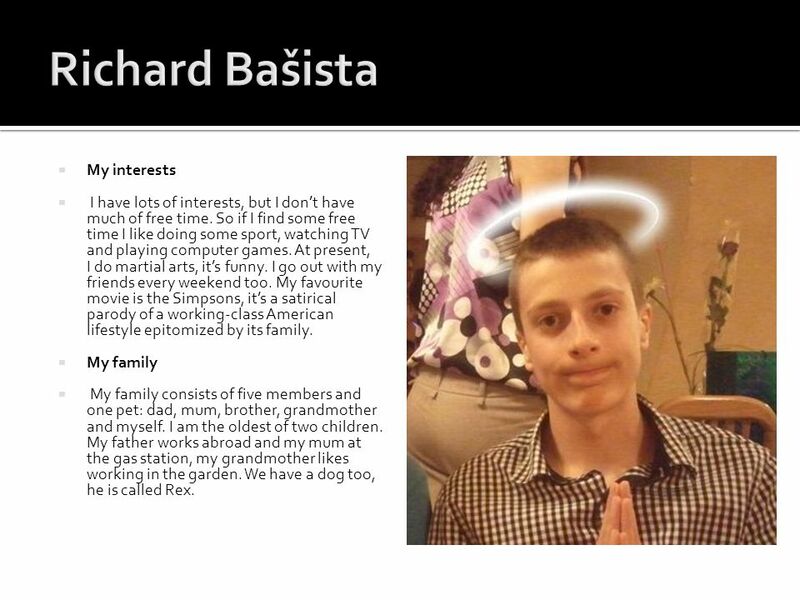 16  Name: Martin  Surname: Barnáš  Class: I.D   My family  I have a big family. My mum Tereza and dad Fero aren´t old. I have two  sisters – Dominka is seventeen yars old and my princess Teri is seven  years old. My brother Fero is 14 years old. I´ve got four grandparents, a  lot of uncles and aunts, and also maybe ten cousins. I love everybody in  my family. But sometimes I don´t like my brother because he is very  annoying.   My inrerests  My hobby is ice-hockey. Ihave been playing it for maybe nine years. I´m a defender and I have five trainings and 2 matches per week. At first I played football, but my dad wanted me to be a hockey player because he played ice-hockey, too. I like it, because it is a beutiful sport, but sometimes I want to finish with it. Prešov is Prešov and here this sport is only hardly ever beutiful. 18  My family   I have two younger brothers. The youngest Dominik is my little sun. :) He is one and a half year. The second brother is eight years old, but he´s got his world of cars. Mommy is my big support when I have hard times. My family is the most important for me. I really love my family!   My friends   Friends are very precious for me. They stay with me when I have some  problems, and laugh with me when I feel sad. I have many friends, but 2 or 3 are real friends. With friends I have lots of funny times. When I go out we always do some craps. :D I enjoy every moment with them, and I am thankful for my true friends! 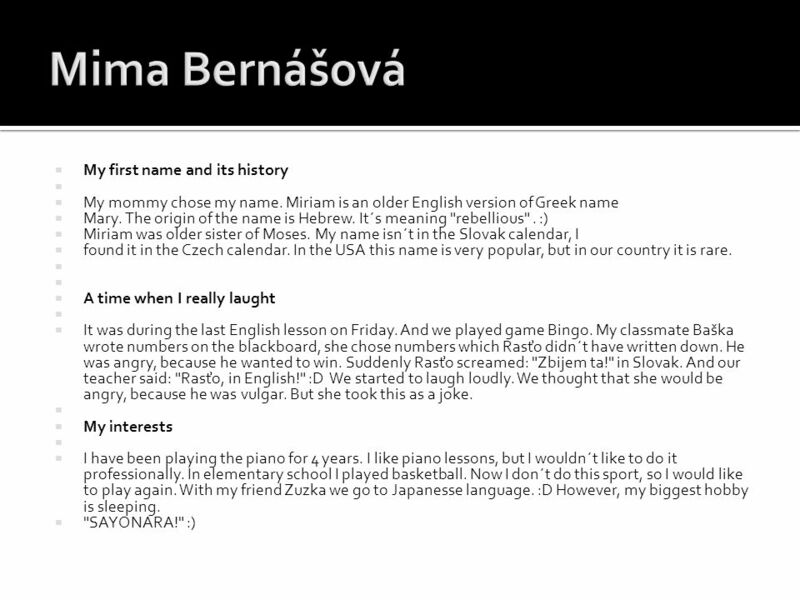 20  My name is Mirka Fuchsová.  I´m 15 years old and I am a student.  I live near Prešov, in Kanaš.   My Interests   My most favourite interest is dancing. I dance always when I want, every day, every minute of my life. I started dancing 8 years ago. I first danced in Šarišanček, now I dance in Šarišan. It is one of the best folk ensemble in Slovakia.  For over 60 years. young people play, sing and dance in the ensemble, performing annually in over 70 live shows in Slovakia as well as abroad.   My Family   My family isn´t big. I live with my parents. 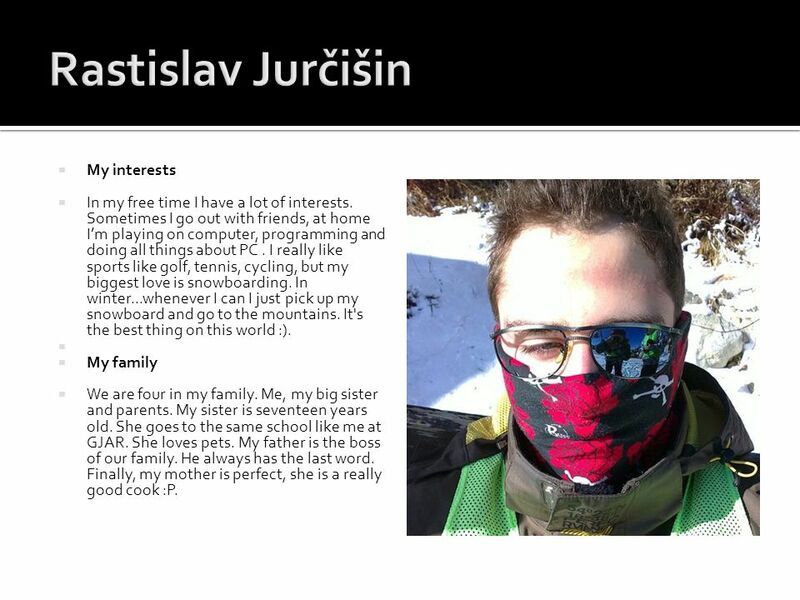 I have one brother, Jakub. We have already been together in many places.My parents try to give us everything and I admire them for that. I have one brother, Jakub. Recently he has been 18 years old. My mum is perfect. She is there for me when I need something. She has never told me: „No“. My dad is my idol. I would like to be like him. He works at the secondary school as a director. My brother is my best friend. He knows everything about me and he is perfect too. We are very different but I cannot imagine that I would not be like that. And I have a dog. I got it for my birthday, it is called Eddy. 21  A time I really laughed   I can’t think about just one moment when I laughed the most, because I laugh every day. When I was little, I always laughed, my parents laughed with me when I was discovering the world and feeling the family bond and the harmony. Now I have many memories to remember connected with a smile, like recently when we were on a skiing course and we were singing in the bath with my friend and a roommate at the hotel was listening to it, it was awful when we came out of the shower but the whole evening we were laughing at that situation.   My Friends   I think I haven´t got many friends that I consider to be real friends. They make me happy and always give me a reason to laugh but sometimes also to cry. My friends are my life. I have 3 best friends: Franziska, Lucka and Niks. I went to elementary school with Franziska but she went to a different school. Lucka and Niks go to Šarišan with me but they are singers. They are for me like big sisters that I didn´t have.   The most challenging situation   A year ago when I first found myself in the situation to decide where I would go to secondary school. It was only my decision which was not easy and my future depended on it. I remember it as if it was just yesterday. But now I know that I have chosen the right school. I got to know great people although I miss my former classmates. Sometimes we meet and go somewhere. 22  My interests  In my free time I have a lot of interests. Sometimes I go out with friends, at home I’m playing on computer, programming and doing all things about PC. I really like sports like golf, tennis, cycling, but my biggest love is snowboarding. In winter...whenever I can I just pick up my snowboard and go to the mountains. It's the best thing on this world :).   My family  We are four in my family. Me, my big sister and parents. My sister is seventeen years old. She goes to the same school like me at GJAR. She loves pets. My father is the boss of our family. He always has the last word. Finally, my mother is perfect, she is a really good cook :P.
23  A time a really laughed  I laugh every night when I call with my friend on Skype. We laugh on all things. We laugh when someone says some stupid thing but also when someone says a good thing. :D. I love these nights. Sometimes we sing one song and its really funny :P.  My friend  My best friend is Lubos. I have known him for ten years. He is a perfect person, sometimes he is really stupid but I like him. And I have a lot of friends but not all are serious friends. I love my classmates, they are like my siblings. A friend is the best person on this world.  My favourite subject  My favourite subject is computer science because I love computers. I know all about computers. In the future I want to be a programmer. I love PC games and I love programming. When I was ten years old I did my first PC game. It’s a really stupid game :D. Now I am working with operating software. I want to hack NASA:P.
24  My interests  I have lots of interests, but I don’t have much of free time. So if I find some free time I like doing some sport, watching TV and playing computer games. At present, I do martial arts, it’s funny. I go out with my friends every weekend too. My favourite movie is the Simpsons, it’s a satirical parody of a working-class American lifestyle epitomized by its family.  My family  My family consists of five members and one pet: dad, mum, brother, grandmother and myself. I am the oldest of two children. My father works abroad and my mum at the gas station, my grandmother likes working in the garden. We have a dog too, he is called Rex. 25  My friends  I have lots of friends, I think, but I don’t have many close friends. Many friends are my classmates. I do not have the best friend, but I have a few close but really good friends.  A time I really laughed  I always laugh and everywhere. I sometimes laugh without some reason. I laugh at some funny situation or when I remember some funny event. Unfortunately I do not remember any funny event now. 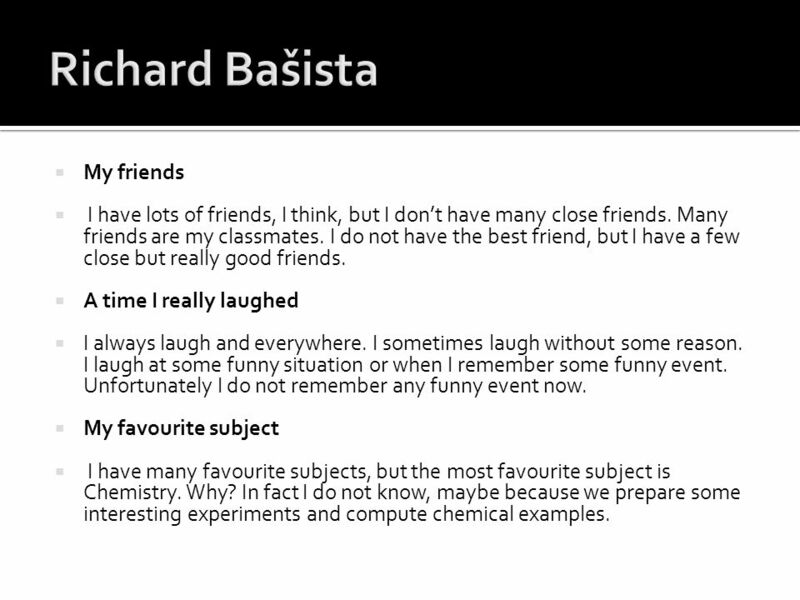  My favourite subject  I have many favourite subjects, but the most favourite subject is Chemistry. Why? In fact I do not know, maybe because we prepare some interesting experiments and compute chemical examples. 26  My Interests  I have lots of interests. I have been playing table tennis for 7 years and nowadays I often go to competitions. According to me it is the best sport. Then I like volleyball, football, basketball and cycling. I love reading books, mainly fantasy and thriller genres. My favourite book is Name of the Wind. I sometimes watch TV or play computer games. When it is possible I always listen to music on mp3 player. I listen to almost everything. I have started to learn playing the guitar and I like it.   My family  My family has four members : my mother – Beáta, my father – Marcel, my sister – Simona and me.  My father is an officer and he is 52. His hobbies are cooking, playing table tennis and tourism. He plays the guitar and the piano.  My mother is a teacher in kindergarden. She is 47. She likes dancing and watching romantic films.  My sister is attending Gymnazium Konštantinova and she is 18. She loves dancing, singing and her hobies are : reading books and listening to music.  She has been attending piano lessons for 7 years.  I love them. 27  My friends  I have many friends but only a few really good ones. I go out with them or we visit each other and play computer games. They are very important to me.   Something I wish I could do  I have always wanted to travel all over the world, see plenty  of species of animals, mainly in the see, because see animals have always fascinated me. I would like to dive somewhere in Indonesia. Then I wish I could climb some high mountains.   A time I really laughed  I laugh very often, but I will never forget when we were on trip in Kopytovska dolina with my class. We had a great time. I was laughing all the time. After this trip I had a muscle ache for a week.   The career I want to pursue  When I was younger I wanted to be a scuba diver or an archeologist. But now I am not sure which job I want to do. I want to do something outside or some work with animals, maybe a vet.   My favourite subject  My favourite subject is definetely PE, because I love sport and we have a great teacher. There is always a lot of fun. 29  A time I really laughed  I experienced many funny moments. But one experience with my great dad. I was coming back from Bratislava and my father was waiting for me at train station in Kysak. I threw my bag to our car and slammed the door. Suddenly the car moved and went away. My dad thought I got into the car, but it was only my bag. :D I started to laugh loudly. I couldn’t stop. A few meters he noticed I wasn‘t there. He came back and we were laughing together. Perfect end of holiday in Bratislava. :D   My friends  My second family are my friends. I have many friends but only a few true good friends. When I went to GJAR I was afraid that I would lose old friends but it is OK and we still meet. Here I met 29 new people and some of them are really good friends now. I am happy that I have them. Now I have maybe 3-4 best close friends. I like them and I can‘t imagine living without them. =-*   My first name and its history  My first name is „Zuzana“. Name´s origin is Hebrew – Šóšanna. It means lily. Women with this name are innocent, pure and virgin as white lily. Name Zuzana is very popular in Slovakia. I think, it is neutral, it is quite a nice name. My name has characterised me as peaceful and supportive. 30  My interests   I have a lot of hobbies. I like playing the flute. I visited ZUŠ Mikuláša Moyzesa for 7 years, but last year I didn’t go, because school year on GJAR began and I didn‘t have enough time  for practising. My biggest interest is Rozmarija. I love folklore and these songs. I don´t dance, but I play the flute. I have been playing there for 3 years and we have visited many countries so far for example Greece, Bulgaria, Russia and in April we are going to Turkey. In winter I love skiing. It is my favourite sport. I began skiing 7 years ago.   My family   Our family isn´t big: I, my sister, brother, father and mum.  My father  His name is Jozef. He is the head of the family. At the moment he is working in PSS. He is funny.  My mum  Her name is Janka. She likes cooking and baking. She is the most important person in my life.  My brother  My brother‘s name is Martin. He is the oldest child. He is 20 years old. He goes to Ekonomická univerzita in Bratislava. He loves football.  My sister  Her name is Andrea. She is younger than me. She is 15 years old. Andrea plays the flute too.  I  My name is Dominika. I am 16 years old. I am younger than my brother, but I am older than my sister.  I love my family. 31  A time I really laughed   Our class was in Tatras. We were skiing. One day I and my friend had a shower after skiing and we were singing. Suddenly somebody knocked on the door and said: “ Nice but we cannot hear you.”   My friends   I have a lot of friends. They are very important people in my life. I don´t have the best friend, but I have a lot of very good friends. We go to the city on Fridays‘ evenings. We usually go for a pizza or to a bar. Our relationships are very good.   The career I want to pursue   My big dream is to be a doctor for children. I like babies, because they are sweet. And why doctor? I don´t know, but I want to help other people. I hope that this dream will become reality. I know that it isn´t easy but I will try. 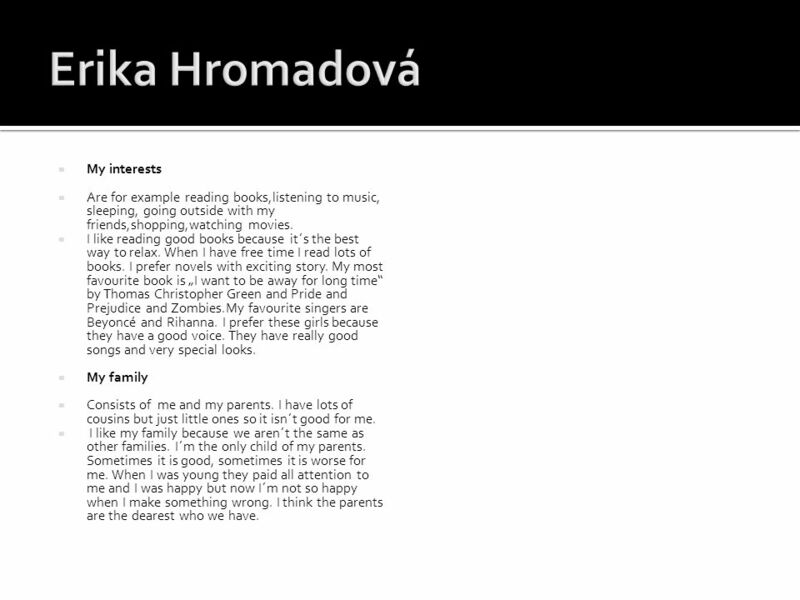 Download ppt "English project page Učíme sa pre život, 1. 10. 2009 Kód ITMS projektu: 26110130243." dance, sing, raise Mickey and Mini are dancing to the music, singing and raising their arms. Ági Hello. My name’s Ági and I’m a 10th course student in our grammar school. I really feel good here, love my classmates, we have been getting on well. Have you ever been abroad? - Yes, I have. - No, I haven’t. Why me? By: Daniela Julca. WHAT IS THE BEST WAY NOT TO WASTE TIME? Year 7, unit 8, lesson 3. By Wendy McGurk. My Grandmother  This is my grandmother, and she was a big influence in my up bringing. My grandmother is 82 years old and she still. POLISH STUDENTS We go to Primary School number 14 in Warsaw.We work on our e-Twinning project after shool in our English Club. There are fourteen of us. The Bat-Chen Diaries Book of Dreams, Happiness, and Peace Circle Name: Bat-Chen Diaries Class Name: 10 th Grade (Club “Rainbow”) Name of teacher: Elena. Katarína Cvancigerová. Something about me My photo: - I am fifteen years old - I am funny girl and I am very strick on myself - I played basketball for. The hills across the valley of the Ebro were long and white. On this side there was no shade and no trees and the station was between two lines of rails.